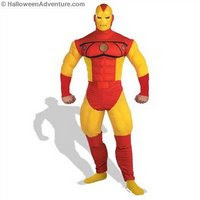 ...for some superhero costumes! This fantastic flick (I'd totally recommend it on a night when you're looking for a funny film) spoofs all of this year's action movies and throws in a big dose of cultural reference while they're at it. Besides being spectacularly hilarious, the movie provides plenty of inspiration for costumes. Hey, might as well start thinking ahead of time, right? One of the superheroes spoofed in Disaster Movie is Iron Man. 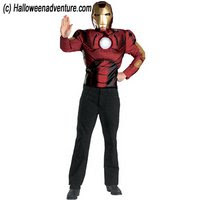 I loved the original Iron Man, from his story to his fantastically strong costume, so it's no surprise that he's been featured on our blog multiple times!